First, I want to give credit where credit is due to ChuckEats, whom I do not know except through his blog which I stumbled upon, but whose blog I leaned heavily upon when selecting restaurants to patronize on my trip. In fact, we made it to three of the places he spoke highly of; in addition to RyuGin, we also hit Sawada and Koju. He did not steer us wrong. I followed his advice for several reasons. Firstly, there are a mind boggling number of restaurants in Tokyo; even coming from New York it is thoroughly overwhelming. Having a place to start made it much easier to narrow down the countless choices. To illustrate, when the Michelin guide for Tokyo came out, it awarded both more total stars and more three star destinations than Paris. 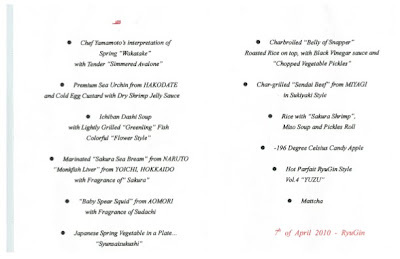 In fact, whereas most Michelin guides include many un-starred but recommended restaurants, the Tokyo guide had no room for merely recommended places since it filled the entire book with starred establishments. The second reason for using the recommendations was that is was exciting reading another review and seeing pictures of the food weeks before the actual trip; the anticipation itself was fun, which was greatly aided by the visual aids. For example, here's his review of his trip to RyuGin. Looks good, doesn't it? The third reason is because I knew I was very likely to trust his opinion since we had similar opinions on many places where we both have dined, eg Masa (my post) or Momofuku (my post). Ok, sorry for the long intro, on to the good stuff. This was an excellent way to start our trip. It had several "best I've ever had" moments (some of which were to be surpassed later on this trip, but that's a good progression). The first course of abalone was one of these moments. When I've had it in the past I've usually found it fairly tough, and frankly slightly boring in taste. This was a perfect specimen; a delicate and pure taste of the sea and, as advertised on the menu, perfectly tender. The second course made it two for two in the best I've ever had dept. The Hokkaido Sea Urchin utterly sweet, perfectly fresh, and simply luscious. To my knowledge, I've never before had uni from Hokkaido, and it's my new favorite. If I had one criticism of this dish, I would have preferred more uni and less shrimp jelly, but that's only because the uni was so awesome. The uni was followed by the dashi soup, which I recall liking, but further details elude me, so I'll just leave you with a pic. Following are pics of the initial presentation and the dish after the reveal of the sashimi course, as the sea bream was hidden under a leaf. This course presented, for the third time of the night, yet another best in my life taste in the monkfish liver. I've heard it called the foie gras of the sea, and in previous tastes of the liver I've understood the reference but been underwhelmed, yet this time it truly lived up to its alternate moniker. This example truly had the melt in your mouth lusciousness of foie, with the requisite richness, but with a taste of surf rather than turf. We were instructed to try the two items together, and they did prove a heavenly match in flavor. I do have to admit that the sea bream, while tasting superb, had a too tough texture for my taste. However, I view that fact as an indictment of my palate and preferences, not of the selection or preparation of the fish. 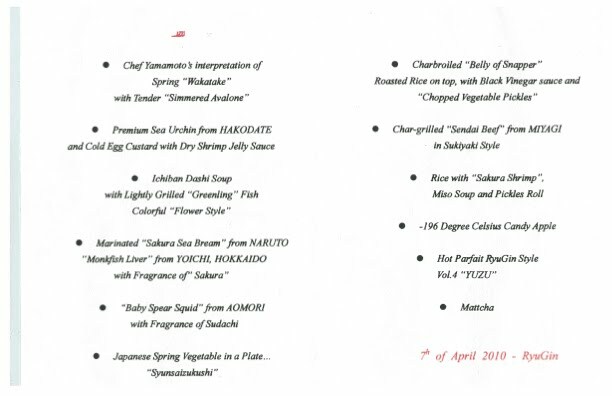 As a side note, the menu indicates that, like the uni earlier, the monkfish liver was from Hokkaido. I can only assume that a visit to that magical place would be nirvana. I intend to investigate in the future. Next up was the "Baby Spear Squid", which, along with the next course, revealed a theme of extreme seasonality which was to graciously weave its way through our whole trip. Apparently the spear squid was near peak season, and in the case was stuffed with more squid. It was treated very simply, letting the ingredients shine, and as with the abalone in the first course, extremely tender. Unfortunately this picture hardly does justice to the beautiful plating of vegetables we were served. I apologize, and also feel bad for depriving myself of a better aid to memory. In any case, this dish consisted of dozens of varieties of vegetable, each cooked (or not) individually. Some raw, some fried; blanched, steamed, sautéd, grilled, pureed, etc. Asparagus, mushrooms, carrot, herbs, fiddleheads, bamboo shoots, and on and on. I scarcely have a point of reference to compare this excellent mosaic of vegetables to. Really fantastic. This dish of Charbroiled "Belly of Snapper" was the one disappointment of the night. I loved the flavor and texture of the Roasted Rice crust, but I found the actual fish somewhat overcooked. The sukiyaki style Sendai Beef was an excellent example of top quality Japanese beef, with an interesting crumble of herbs and, if I recall correctly, something akin to dried shredded pork, which added an nice counterpoint of texture. The meatball in the background was fine but didn't rise to the bar set by the previous courses. As with the vegetable dish, I am at a loss to convey how delicious this simple rice and shrimp was. (There is something I find strangely satisfying about consuming another entire creature whole, btw.) This was just plain good. Very nicely balanced, nice contrast of texture, and excellently seasoned. I can only dismay at the fact that I was very full at this point, and, being our first activity after hours and hours on the flight, somewhat tired, I had to decline the chefs generous offer to bring out an additional rice cource with baby sardines. I'm quite sure it would be a worthwhile experience, but I just could not in good consious take him up on the offer. Dessert was overkill at this point, but the two desserts presented were creative and playful. They also continued a theme from the whole night of dishes with contrasting textures and temperatures. The first was a very cold frozen foam hidden inside a candy shell (expertly shaped to look like an apple) topped with a warm apple compote. The first dessert was a frozen component accented with a warm sauce, and the second was a hot cake accented with an ice cream. I was approaching a coma from both the food and the travel at this point, so I'll let the diagram that accompanied the dessert speak for itself. All in all a fantastic meal. There is one thing I feel the need to address however. I can hardly be disappointed by this superb bar setting meal, but I think worth mentioning that the restaurant seems to have shifted closer to more traditional fare than the meal as described at ChuckEats. Not that this is a bad thing by any means, and I'd hardly give up the meal that I had given its quality really set the bar, or in fact many bars, but I would have probably slightly preferred to expect less experimental stuff. As much as I gushed about the food, it was actually probably better than I could convey in some cases. But I'm still a little jealous that I didn't get to try some of the dishes I had read about. On last note: as we were pulling away in the taxi the chef literally ran out of the restaurant to greet us and enthusiastically wave goodbye with both hands. I kinda felt bad that maybe we had shuffled off too quickly after paying the tab and got the feeling he wanted to say goodbye, but we were dead tired. His send off did leave us with a great feeling however, which was a nice touch. I'd definitely make a return trip. Highly recommended. Oh, and they speak excellent English.